The Marina del Rey Historical Society (MDRHS) extends a warm welcome to its newest director, Anne Sacks. A decades long Venice resident, art major, and lifelong boater, Anne brings to Marina del Rey Historical Society a special dedication to the interests of the recreational boating community. 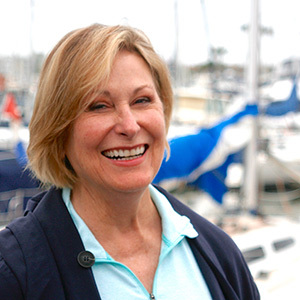 She has been actively involved with Recreational Boaters of California (RBOC) as director and past president, currently serving on the Santa Monica Bay committee and as chair of the Communications and Outreach Committee. RBOC is a nonprofit advocacy organization that promotes the state’s recreational boating interests before state and local government. She has also served on the board of directors of Southern California Yachting Association (SCYA), the Pacific Coast Yachting Association (PCYA), and as staff commodore of California Yacht Club (CYC). Anne’s personal devotion to boating dates back to early years sailing with her father in Los Alamitos and San Diego. In 1962, the family relocated its vessel to a newly constructed Los Angeles area harbor named Marina del Rey. For the next five years, the family’s local California Yacht Club (CYC) membership meetings took place at a Sheraton Hotel (what would become today’s Marina del Rey Hotel), as the club awaited its eventual dedicated facility grand opening in 1967. Anne was born in San Francisco, grew up in Whittier Hills, and personally recollects comparing apples and oranges during family grocery shopping excursions to their local Nixon’s Market. She attended UCLA earning a bachelor of arts degree and continued on to earn a masters in fine arts (M.F.A.) degree from Otis College of Art. She has served on the faculty of the Marlborough School as both administrator and fine arts teacher. She currently serves as volunteer for the J Paul Getty Museum.